Just four votes kept this seat for Michelle Gildernew in the last election, ahead of united unionist candidate Rodney Connor. Former UUP leader Tom Elliott is the single unionist candidate here and another tough nationalist vs. unionist battle is underway. Every vote will be counted here to ensure that, two days after the anniversary of the death of Bobby Sands -- the seat he famously won -- will not be lost to the man who grabbed attention at the last Assembly election count by roaring about Sinn Fein ‘scum’. Years of scheming by the DUP has gone into winning back this seat, and they will be devastated if Gavin Robinson fails to overtake Naomi Long of the cross-community Alliance Party. Her shock victory over DUP leader Peter Robinson was the story of this election five years ago, and her defeat this time out could be equally symbolic -- but perhaps not as unexpected. The unionist pact is at its most cynical here. Sinn Fein has assiduously worked the hyacinth-scented boulevards of this constituency, and they will surely be building on a result here for future elections. Despite the threat posed by Sinn Fein’s own media mogul, Mairtin O Muilleoir, there has been little response from the SDLP party leader, Alasdair McDonnell. Probably the best chance of a gain for Sinn Fein. Sinn Fein have been at pains to point to the slight nationalist majority in this constituency, but the use of census figures to highlight the numbers of Catholics versus Protestants may have been counter-productive. Unfortunately, Dodds is likely to take advantage of the unionist pact, as well as sharp divisions among nationalists, and hold his seat. Paul Maskey of the Maskey clann is guaranteed to hold his seat in Sinn Fein’s safest stronghold. Otherwise, socialists will be interested to see if Gerry Carroll can increase his vote. A long-standing target seat for Sinn Fein, but it is probably too much to ask the hard-working Chris Hazzard to unseat the quiescent former SDLP leader Ritchie -- this time around. GAA football star Justin McNulty, a surprise celebrity selection by the SDLP, looks like something of a lightweight alongside political veteran Mickey Brady, who should retain Conor Murphy’s former seat for Sinn Fein despite the unionist pact operating here. Gearoid O Heara has taken up the flag for Sinn Fein from Martina Anderson, now an MEP. In theory Sinn Fein should benefit from the absence of socialist campaigner Eamonn McCann to challenge the SDLP’s Mark Durkan for the seat this time out, but a lot will depend on whether unionists vote tactically to keep SF out. The UUP have put in a big effort here to promote Jo-Anne Dobson, but few expect her to unseat the bible-thumping David Simpson of the DUP. Sinn Fein’s Catherine Seeley could get in among the pigeons. Sinn Fein’s Francie Molloy took over from the party deputy First Minister Martin McGuinness in a by-election here two year ago, and has some years yet to serve in a safe seat for the party. A happy status quo for Sinn Fein’s Pat Doherty here. Ian Paisley Jr. will be leading the singing of ‘God Save the Queen’ once again in one of the DUP’s safest seats, but it will also be interesting to watch the votes here for unionist ultra, TUV leader Jim Allister. Three Wilsons to choose from, but the DUP’s version is again very safe in this unionist heartland. A little-known UUP candidate is unlikely to trouble country-singing Willie McCrea. Sinn Fein are looking to party strategist Declan Kearney to increase on the vote built up over the years by Mitchel McLaughlin. The principality of north Down is likely to return former UUP MP Sylvia Hermon, again running as an independent and not being challenged by her former party. 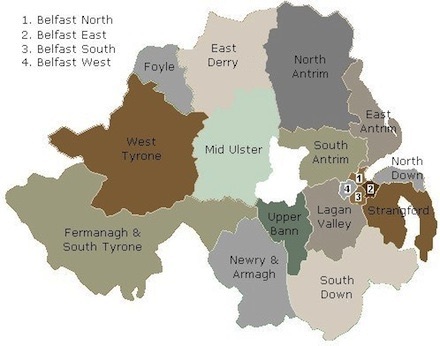 The DUP are hoping for a beach-head in this unpredictable but overwhelmingly unionist constituency. Sitting DUP MP Jim Shannon likely to be untroubled by another little-known UUP candidate. Relatively few votes here again for nationalists, but Sinn Fein could compete with the SDLP as Claire Hanna steps away. Fairly token UUP opposition here to the DUP’s Jeffrey Donaldson, who has made this seat his own. The nationalist candidates will have their own fun. Campbell’s bigoted ‘curry my yoghurt’ comments about the Irish language will have only curried favour among the unionist backwoodsmen here. A safe seat for the DUP.